Massive thank you to everyone at EOS I.T Solutions for their support. Over the Festive period, the team held a Christmas Jumper Day on December 20th for PIPS Hope and Support raising a fantastic £800.00. Headquartered in Banbridge with operational offices in California, Singapore, Australia, Brazil, Hamburg, India and Japan, the guys offer their services to all sizes of companies going beyond the normal IT services. On 16th January 2019, we were invited along to their office in Banbridge for a cheque presentation. 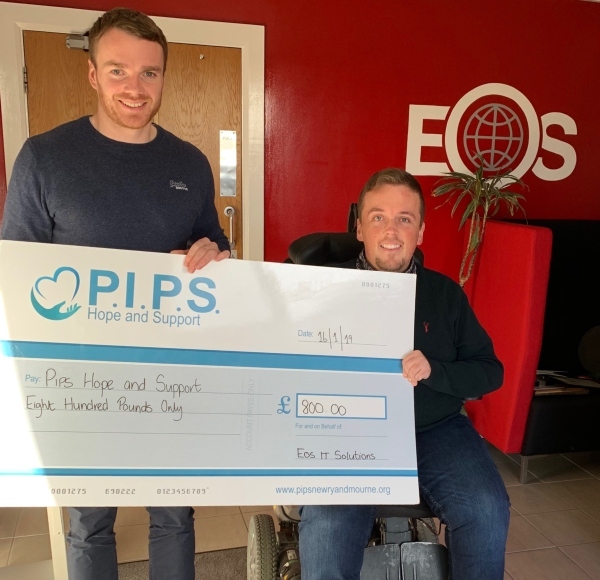 Sincere appreciation from us all at PIPS Hope and Support to Tara, Benny and everyone at EOS IT Solutions. The funds donated will go a long way in supporting the provision of our service. Best wishes and success to you all for the year ahead.